As I contemplate taking down the Christmas tree and all the decorations, packing and putting away, I wonder about the New Year and what it holds in store for me. What circumstances will I be a part of? What people will come into and or leave my life? How will the devil try to attack me this year? Don’t get me wrong, I’m not worrying, just pondering. As I see the packaging boxes in my garage waiting to be filled with Christmas, it’s always a little sad. 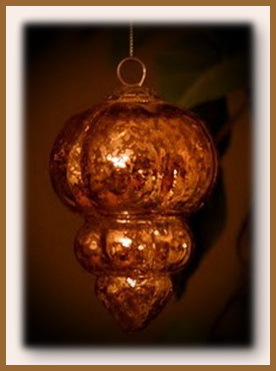 So, last year I kept one of the golden ornaments out and left it hanging in my entryway all year. It will stay there from now on. Even though the Christmas holiday is coming to an end, the Christmas spirit can go on forever and the glistening of that ornament is just a symbol of that. Again, don’t get me wrong. I never need a reminder of my Lord. He is with me always, but when those hot, humid months roll around, the feeling of Christmas, good tidings, good cheer, the giving spirit that we feel in December, somehow gets lost by June. I must not be the only one with these thoughts because of the quotes I found. Here are just a few. . .
Christmas is not just a time on the calendar; it is the baby in the manger who came to save mankind. Peace and joy is not just for December but for always if we accept the one who came to offer it. As I think about the coming New Year, I look at that golden ornament with the light flickering from it and know that the true light of Christmas is within me. So I look forward with anticipation and eagerness to start it, knowing that Christmas is with me always. Let’s not say farewell to good tidings, Christmas cheer, a giving spirit, peace, and joy. That can be with us for 12 months, year after year. I have seen people I know along with strangers come together in love and compassion to help the less fortunate this Christmas season. My heart leapt for joy every time I saw a new donation for the homeless and needy children. That is truly a gift; a compassion flowing forth to those who need help, need love spread all over them, need the touch of Christ from another fellow human being. May this keep going on month after month. And if I ever start to forget, may the Lord use the sparkle of light from my golden ornament to remind me of Christmas, Christ in the every day, of giving, spreading good cheer, feeling joy that only comes from Him, and peace that passes all understanding, reaching out and loving the lovables and the unlovables. May you all have a bright and shining New Year. And don’t be surprised if you hear me say “Merry Christmas” in June. ~Please visit Kristin’s great site Ponderings.